Proportioner QDV | Pro Chem, Inc. The PROPORTIONER QDV dispenser offers a unique way to dispense a wide variety of automatically diluted solutions into spray bottles, buckets, and other containers. This system provides dilution control for multiple products, at multiple flow rates, while eliminating the possibility of chemical carryover. 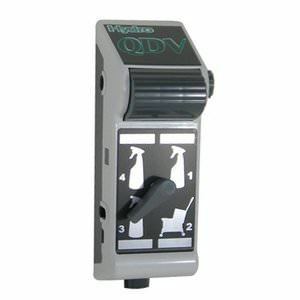 The PROPORTIONER QDV system uses a unique diverter valve technology to deliver multiple product dilution control. The diverter valve channels incoming water to the proper eductor, which meters the appropriate amount of chemical into the water stream using a selected metering tip. The use of four separate eductors eliminates the possibility of chemical carryover, and additionally allows the user to combine high flow and low flow dispensing in one compact unit. The system is configured to dispense three low flow products (such as a spray bottle) and one high flow product (such as a bucket). A knob is turned to easily choose the product to be dispensed. Backflow protection prevents chemicals from coming into contact with each other, meeting ASSE 1055-B standards. Internal manifold can be easily removed without any tools for easy repair or replacement.